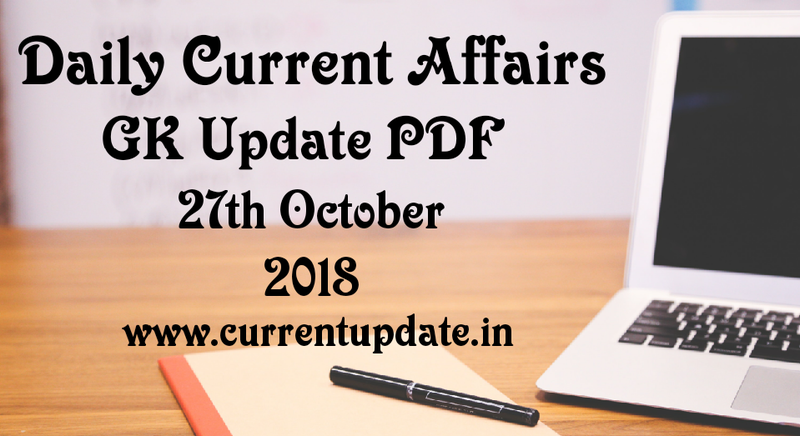 Daily GK Update PDF:- Current Update Provides Current Affairs Daily GK Update PDF in Every Single Day. This Daily GK Update in PDF including different Static GK areas Current Affairs like New Appointment, Awards, Deaths News, Banking News, Economic Update, National News, International News, State Level News, New launching Update, Summit & Conference Update, Defence News, Science & Technology Update, Sports News Update. India Mobile Congress(IMC) 2018 – a marquee event which provided a peep into the exciting future in the rapidly evolving area of digital communications. The mega 3-day event was inaugurated by Manoj Sinha,Minister of State (Independent Charge) for Communications. This year’s event, with its’ theme of “New Digital Horizons – Connect. Create. Innovate.”, established the IMC as a regular platform for global and local stakeholders in the sector to collaborate in the cause of exploring opportunities and leveraging possibilities, with specific focus on South and South-East Asia. The IMC 2018 conference and exhibition was held over a total area of more than 50,000 square-metres, with more than 5,000 delegates in attendance. Delegations from 20 countries participated in the event, which saw more than 300 companies showcasing their latest and best technologies, products, services, and applications.